Ruthiebear (Titusville, NJ, United States) on 29 July 2013 in Animal & Insect and Portfolio. I loved the way this duck looked against the patterns in the water. Funny spectrum of the water and the bird's range. Wonderful patterns on the water. The duck seems to be in a rather uncomfortable posture. I agree... his head really stands out and his wing seems to melt into it. Love the swirling abstracts in the water! Yes the lovely duck seems to be very interested ! A beautiful capture and he blends in perfectly with his surroundings ! Beautifully seen ! Wishing you a happy day . The animal catch is nice, and I love the water here. Excellent closeup and capture of the duck, the water is beautiful. Great shot. Magnificent composition! Great pattern on the water! tout à fait superbe le gros plan et la texture de l'eau. Beautiful colors captured in the mallard accompanied by eye-catching patterns captured on the water's surface!! The duck close up fits the water background very well. Nice one. @Adela Fonts: I missed you! Beautiful picture, the bird knows that he is very beautiful, and that's why it flirts*****! :-))Haleja. Happy Monday to you ,my friend Ruthie! Quelles belles couleurs pour ce canard ! acuática... Magníficos colores y luz..Saludos. I really like the bold Mallard against that 'squiggly' background. Those blue, black, white and tail feathers are so sharp! Wow Ruthie, this looks like a painting! Just beautiful. I love the color of the mallard and the gorgeous swirls in the water! Superb! Perfect water reflex in this composition !! Yes, amazing patterns in that water - I often find I only see them in the images ! I love the close up. Also the details of the feathers are wonderful. polish ................ lovely close up & the reflection from the water. I'm sorry I've been away and missed your beautiful photos. So glad I am able to browse back through the last two weeks. This is so beautiful. Wonderful shot of the lovely one with beautiful colors. The texture of the water is so nice. Yes I love the duck looking into the magical mysterious water too. Wonderful patterns on the water. Nice shot. Beautiful swirling pattern in the water ... great capture! The water is magical! Those shapes are really fascinating, and adding the duck's bright colours, the result is excellent. 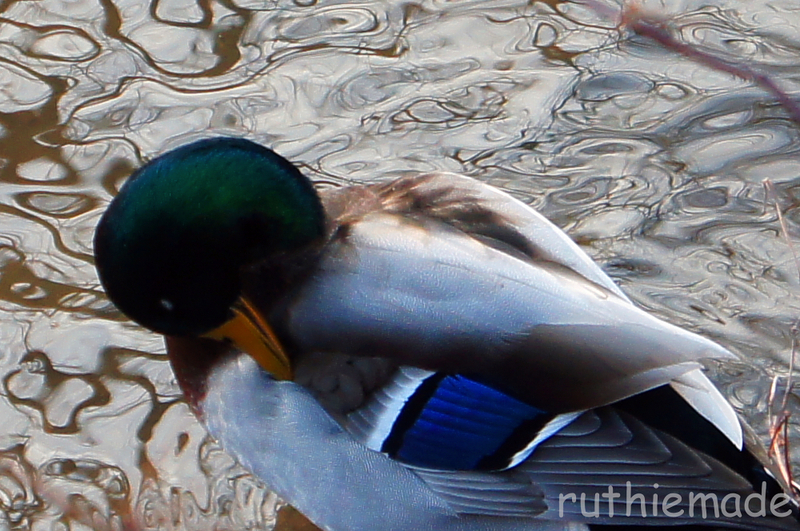 I really like the textures you've caught in the water with this one Ruthiebear, I also like how cute that duck looks! Superbe vue de ce canard avec les reflets en fond génial. A great shot with those lovely water patterns.